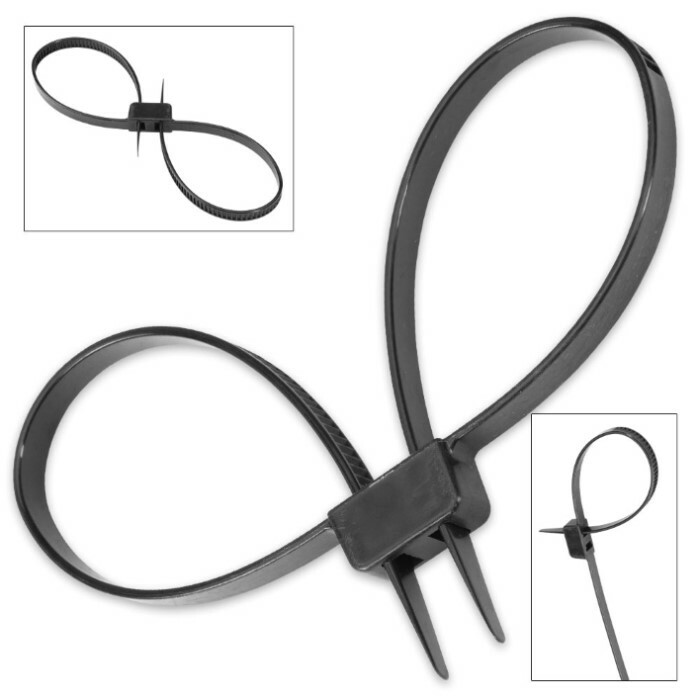 Zip Cuffs / Flex Cuffs / Zip Tie Handcuffs - 20-Pack | BUDK.com - Knives & Swords At The Lowest Prices! Got 'cuffs? Perfect for law enforcement, bounty hunters and security personnel, this 20-pack of tactical zip cuffs represents an extraordinary value on safe, humane, police-grade restraints. The disposable, one-time-use cuffs are made of high strength nylon and each boasts an incredible tensile of more than 250 lbs. Self-locking, double-tooth locks eliminate slippage, maximizing safety for both the restrainer and the restrained party. 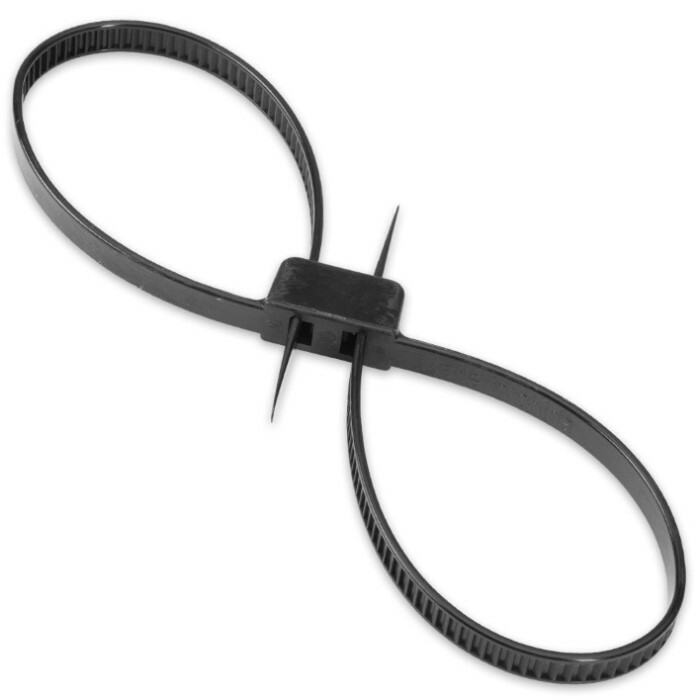 Versatile and convenient, these zip-tie flex cuffs can be used on both wrists and ankles - simultaneously or separately - , and one size fits most adults. Keep some in your vehicle, bug-out bag and around the house for emergencies! This surprisingly affordable 20-pack is the perfect way to stock up! Caution: No quick release. Must cut to remove. Use care when cutting to avoid injury to yourself and/or the restrained party. For the money these black cuffs work rather well. They are shorter than my police issue US Zip Cuffs, so you might Not want to pre-feed the loops before use. The inside is smooth, unlike some other Zip Cuffs, which have the locking side on the inside, which could leave marks on the wrist. They click lock rather positively approximately every 1/4". There is a "ledge" on the locking pawl, which I have been able to raise with a 1/8" 4" long screwdriver and open them more than 20 times, great for training. Since these are Black they should be IR restive if left in a position where the sun can shine on them. They appear to be a newer model of the White cuffs, BK3921, which may be in the process of being discontinued, use the White ones for training and the newer Black ones on the street. Yes, for their use, I recommend them, very handy.